Is hubby having a bad day? Give it a quick and easy turnaround by serving him this quick and easy Rock that Ratatouille dish. 1. Boil reserved tilapia parts in 4 cups water for 15 minutes then set aside. (This is to create fish stock). 2. Rub fish fillet with ¼ tsp salt, 1/8 tsp pepper and calamansi juice. 3. Mix the fish fillet with egg , then coat with breadcrumbs. 4. Fry until just golden brown, then set aside. 5. Dissolve the Del Monte Quick n Easy Gata mix in the fish stock. 6. 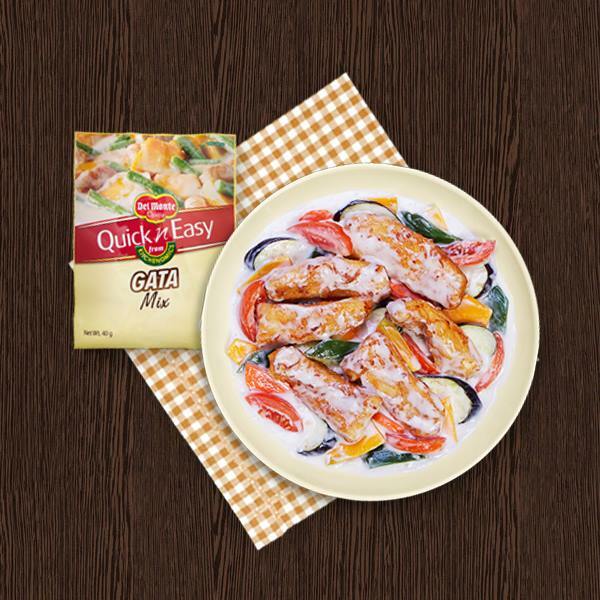 In another pan, combine vegetables and the dissolved Del Monte Quick n Easy Gata Mix. 7. Allow to simmer, while stirring occasionally. 8. Cover and simmer over low heat for another 10 minutes or until vegetables are cooked. 9. Top with fried tilapia. 10. Pour the sauce over the fried tilapia to finish.